I did something today that I haven’t done in ages; I went to the cinema on my own. This is something that I used to do regularly and then just kind of got out of the habit of doing it. I went to see Lars and the Real Girl in the Kino this afternoon and I really enjoyed it. It is so funny in places and so sad too. Ryan Gosling is excellent as Lars, a delusional young guy that forms an unconventional relationship with a silicone doll that he bought on the internet. There are some very heart warming moments in the film especially when the whole community goes along with the delusion that the silicone doll, called Bianca, is a real girl. Bianca gets involved in the church and volunteers at the hospital. She even goes to church with Lars and his brother and sister in law. There is a girl that works in the same company as Lars and one of the cutest moments in the film is when he gives CPR to her small teddy bear that another guy has hung in a noose made from a computer cable. This is an unusual film but it's very appealing because of its warmth and humour. # posted by Coastal Aussie : May 09, 2008 10:29 a.m.
Lars makes up a background story for the doll and tells everyone that she is disabled and needs a wheelchair. # posted by Betty the Sheep : May 14, 2008 8:30 p.m.
Ah, cool. Did you see "Superbad"? That turned out to be much funnier than I expected. A bit slow in parts, but not so 'Hollywood-ish' as most teen movies are. # posted by coastal aussie : May 15, 2008 2:47 a.m.
# posted by German : May 15, 2008 3:40 p.m.
Coastal Aussie: I haven't seen 'Superbad' but it's definitely one that I'd like to see. 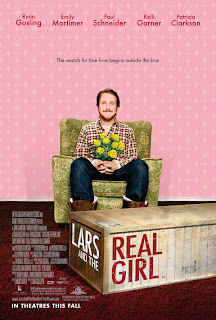 German: Welcome, 'Lars and the Real Girl' is good if you are looking for something different. # posted by Betty the Sheep : May 15, 2008 8:23 p.m.